On Saturday September 13th, I had the honor of representing Aerial Photo Media and giving a speech at a conference hosted by Pingwest and ACE UC Berkeley at UC Berkeley on the Memorial Glade. Executives from some of the industry leading companies such as DJI and 3-D Robotics were present to give speeches as well. The collective insight to the drone industry and show of support was absolutely phenomenal. It’s great to see such an awesome collective of intellect and professionalism driving a positive outlook for the drone industry. Many of the topics involved safety precaution to assist in the FAA allowing further commercial drone usage, interesting data collection technology for mining & agriculture, marketing concepts, and new innovations with future releases. 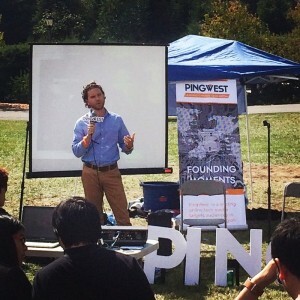 Pingwest did an excellent job of organizing the event from top to bottom, and gathering some of the leaders in the drone industry. A special thanks to a friend, Matt Allen for the invite, and specifically to Pingwest and ACE UC Berkeley (Association of Chinese Entrepreneurs).